Opera is the most complex and interdisciplinary form of artistic expression created by Western culture, all scenic and musical arts are represented. In this state of affairs, in the same way that it is very difficult to totally ruin an operatic performance it is even a greater challenge to achieve absolute perfection. Nevertheless, this is – or almost is – what happened in the premiere of Andrea Chénier at Liceu, one of the foundational titles of the verismo movement which hadn’t been seen on this stage for 10 years. Everything went smoothly from the start, the acclaimed Jonas Kaufmann, who had performed at Liceu before but never in a staged opera, was awaited with high expectancy to perform a role that fits perfectly with his vocal characteristics: stunning and well-rounded high register, fleshy and robust middle and lower range and magnificent projection. Kaufmann didn’t disappoint, from the famous improvviso “Un dì all’azzurro spazio” he won the audience’s hearts with a splendid voice and was moving as if at home in the production, seen at Covent Garden in 2015, which he had premiered. Kaufmann also managed to find exquisite nuances in this score, which is too often sung from strength. In the duet “Ora soave” he exhibited a sweet, intimate soft and totally seductive mezza voce. Kaufmann is definitely an ideal Andrea Chénier. 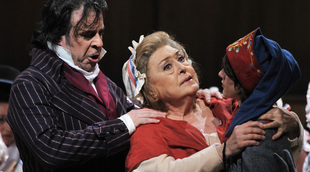 Sondra Radvanovsky, well-loved at Liceu, incorporated for the first time in her career the role of Maddalena di Coigny. It won’t be the last. Radvanovsky also turned out to be an ideal Maddalena in every musical and dramatic aspect. At the end of “La mamma morta” the theatre exploded in applause. The soprano, standing in the middle of the stage was so moved she dropped a – not at all – furtiva lacrima and the audience, always sensitive to these emotional effusiveness, applauded even more intensely. 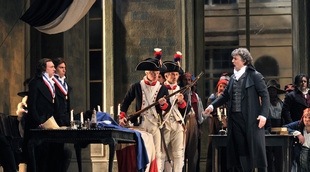 The third element remained: Carlo Gérard, the character whose moral ambivalence makes him the most dense and complex of the piece. He is in fact the only dense and complex character. Here the bet was safe, Carlos Álvarez has been for years one of the best Gérard to be found. However, possibly fired up by the vocal splendour of his colleagues he offered a sublime interpretation. His “Nemico della patria” made an already madness predisposed audience go crazy. To complete the night, the secondary characters were all very good, and it is worth pointing out the presence in the role of the old Madelon of Anna Tomowa-Sintow, who at the age of 76 was still able to deliver this small part with great dignity. The audience expressed their gratitude with warmth at the end. The choir, who in Andrea Chénier doesn’t have any number of brilliance but has a lot of work to do, was quite good. Also good was the orchestra under the baton of Pinchas Steinberg, a specialist in the title who had already conducted the last performances of it at Liceu 10 years ago. The production was also well received. It was originally stage directed at Covent Garden by David McVicar and restaged in Barcelona by Marie Lambert. With a clear and diaphanous lighting, almost cinematographic, by Adam Silverman; with ample, luxurious scenery full of details by Robert Jones and even more luxurious costumes by Jenny Tiramani, this is an absolutely conventional production from a dramatic point of view, which doesn’t re-read nor revisit any aspect of the piece and limits itself to following the libretto, but it does so well and moves the characters wisely on the stage. The impressiveness of the production was the definitive element to achieve a perfect night that will remain in the theatre’s annals. Andrea Chénier by Umberto Giordano. Jonas Kaufmann, tenor. Carlos Alvarez, baritone. Sondra Radvanovsky, soprano. Yulia Mennibaeva, mezzosoprano. Sandra Ferrández, soprano. Anna Tomowa-Sintow, soprano. Fernando Radó, bass-baritone. Toni Marsol, baritone. Fernando Latorre, bass-baritone. Manel Esteve, baritone. Francisco Vas, tenor. Marc Sala, tenor. Christian Díaz, bass. David Sánchez, bass. Orchestra of Gran Teatre del Liceu. Choir of Gran Teatre del Liceu. Pinchas Steinberg, conductor. David McVicar, stage director. Marie Lambert, restaging. Robert Jones, scenography. Jenny Tiramani, costumes. Adam Silverman, lighting. Co-production by Royal Opera House Covent Garden, Beijing National Centre of Scenic Arts and San Francisco Opera.